Gum recession — when the gum tissue covering teeth wears away — is a serious matter. 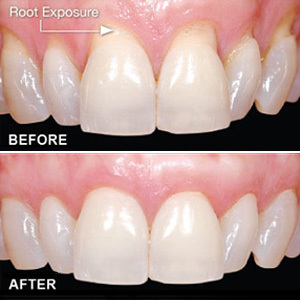 If the roots become exposed you'll not only have increased sensitivity and possible discomfort, your teeth can become more susceptible to decay. There are a number of reasons for gum recession, including overaggressive brushing and flossing, poor fitting appliances like dentures or braces, or genetics (inheriting a thin gum tissue type or poor tooth position). Perhaps the most common reason, though, is periodontal (gum) disease. Caused by bacterial plaque, a thin film of food particles that builds up on tooth surfaces, the disease weakens the gum tissues around teeth, causing them ultimately to detach and “roll up” toward the roots. Treating the gum infection by removing the built-up plaque and calculus (hardened plaque deposits) will help stop recession or even reverse it. Â As we remove plaque the infection subsides and the gums cease to be inflamed. If they haven't receded too far they may re-grow and renew their attachment to the teeth. In other cases, though, the recession may have progressed too far and too rapidly toward root exposure. Gums in this condition may require tissue grafts to the recessed area to create or regenerate new tissue. Most grafting techniques fall into one of two categories. The first is known as free gingival grafting where a thin layer of skin is removed or "freed" from the roof of the patient's mouth (the palate), shaped and then stitched to the recession site. The second category is called connective tissue grafting, most often used to cover exposed roots. In this case the donor material is transplanted from the donor site to the recipient site, but the recipient site's tissue covers the donor connective tissue graft as it still maintains a physical attachment to the original location. The recipient site can thus maintain a blood supply, which can result in quicker, more comfortable healing than with free gingival grafting. Connective tissue grafting does, however, require sophisticated microsurgical techniques, along with the surgeon's in-depth skill and art, to prepare both the donor and recipient sites. Allografts (donor skin from another person) may also be used as a donor tissue and placed beneath the recipient site tissue thereby avoiding a second surgical site. Gum tissue grafting can be an intense undertaking, but the results can be astounding. Not only will restoring recessed gum tissues give your teeth a new lease on life, it will revitalize your smile.